Happy first day of October all! It’s my favorite month for many reasons- especially for one reason- it is the month I met my Mr.! This year marks 6 (He’s quite lucky we met in 2010 because it makes anniversaries easy, peasy)! It also holds special meaning as it is my mom’s birthday month and my late grandmother’s too (just 2 days apart). Lastly it’s my favorite because yeaaaa I am a ‘pumpkin everything’ lover. Can you believe the PSL debuted 13 years ago? Confession: I definitely was a regular PSL order-er in high school and college. I rarely have a PSL now (had 1 this year, but hadn’t in 2-3 years?) due to the fact that I don’t buy coffee out much and they make me feel crappy from the combo of coffee, sugar, and milk (hello nausea!). I find that I enjoy making homemade pumpkin items the best-can’t beat the freshness, knowing what is going into the recipe, and the taste! This brings me to the reason of my post- Pumpkin Spice Truffles by The Spicy RD! Simple ingredients and relatively easy to prepare as they don’t require any baking (I only used a microwave and food processor). They make for an incredibly delicious gluten-free, plant-based dessert/snack (using dairy-free chocolate). 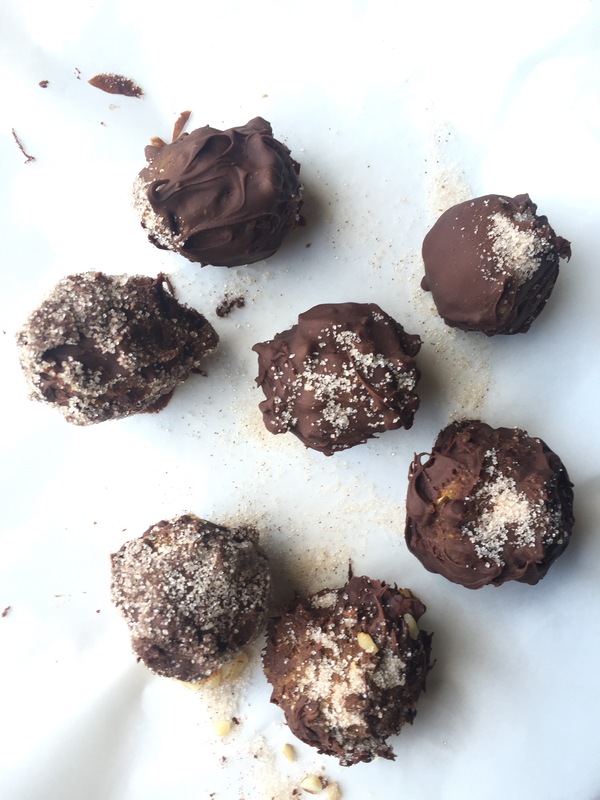 If you have seen my previous posts/ recipes, you know I love a good protein-based ball snack! I can’t wait to make these again and take them to a fall get together. The Spicy RD really did an amazing job with this recipe! You can also follow her for healthful recipes and nutrition posts. When making this recipe, I didn’t have all the ingredients- see my tidbits of info below on how I still made them happen! Spice-wise, I used 1 tsp of all spice and 1/2 tsp of cinnamon – I didn’t have all three of cinnamon, ginger, and clove, so I decided to use all spice and extra cinnamon. I used the full 1 cup of nuts in the recipe (did not set aside 1/4 cup) & added extra dates (6 total)- I made this quick, so you will see my nuts weren’t ground thoroughly and the extra dates provided the extra umph needed to hold them together! I originally made these without chocolate, because I didn’t have chocolate on hand. They were just as tasty! If making without chocolate, to boost the sweetness I added 1 tbsp of brown sugar. I topped mine with table sugar and cinnamon as I coated with chocolate a day after I made them and didn’t have the extra chopped almonds. 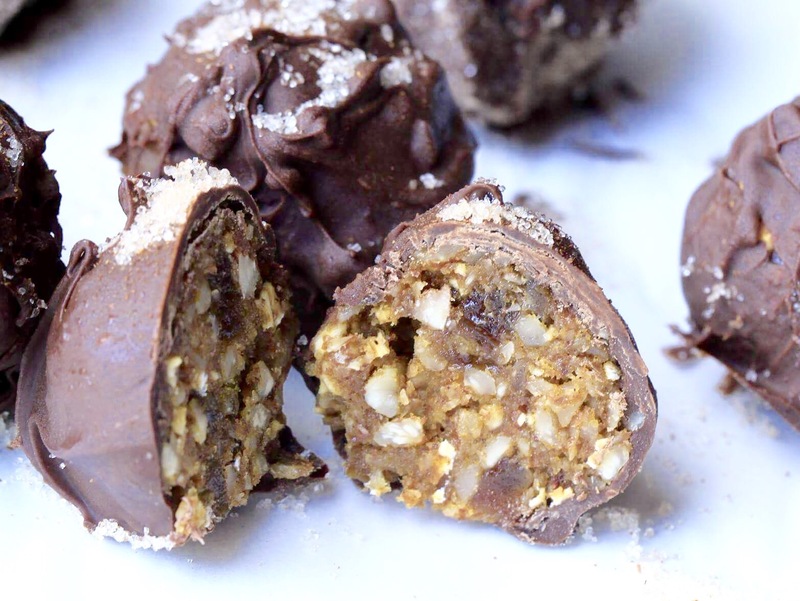 Next time I make these I am going to roll the truffles in the chopped almonds for sure! 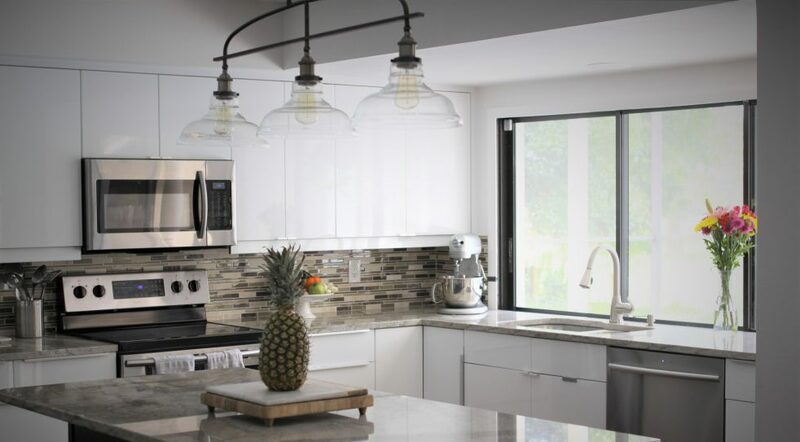 In case you missed the link above, click here to find her recipe and post! Happy and healthful baking this fall, y’all! So many fabulous things to celebrate this month! My husband, Mr. Spicy, and I celebrate our 17th (wow!!!) anniversary on the 23rd, so I’m kinda’ partial to October too 🙂 I love that you made these 2 times already-both with and without chocolate, and great tips for changing the recipe up to your ingredients on hand-it’s such an adaptable recipe. 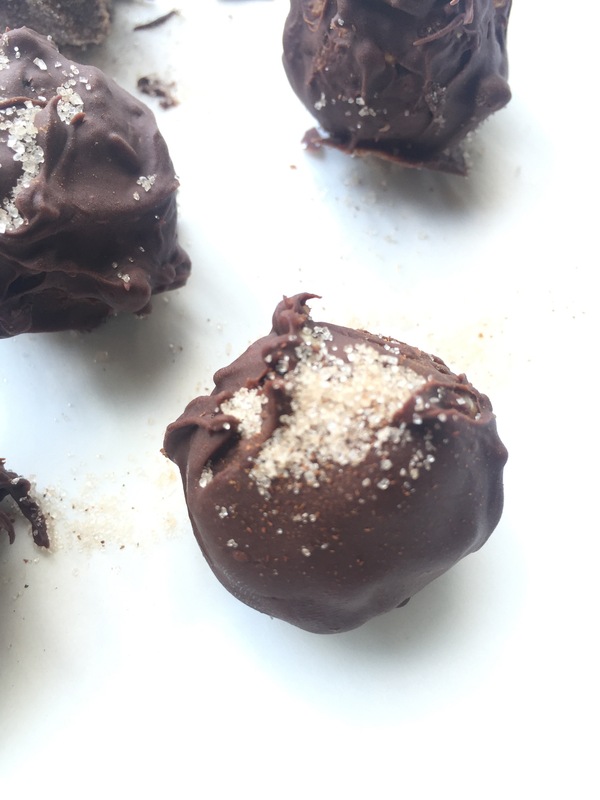 I just finished my last truffle yesterday, so I’m going to need to whip up another batch too 🙂 Thanks so much for the shoutout and for sharing! !